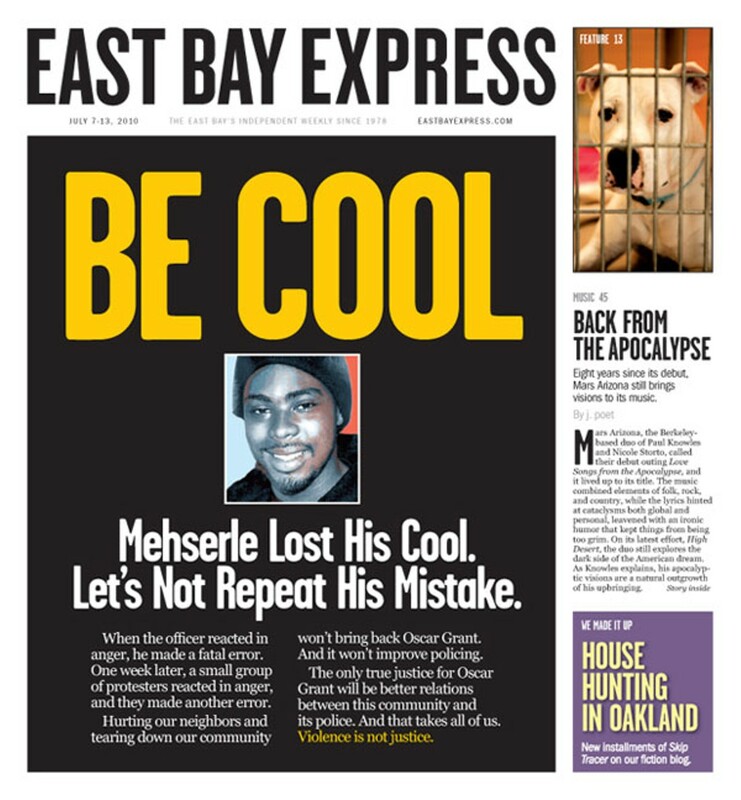 Readers sound off on Oakland police, the Berkeley Bowl, Mandela Foods Co-op, and that cover. Thank you for publishing my letter concerning the parable of Joseph and the Pharaoh; however a mild rebuke is in order here. The Bible is (as far as I know) the largest collection of ancient literature to be found between two covers, and one of the most widely read. Whether a person is religious or not, it behooves them to get Scripture right. I paraphrased and extracted when I wrote that parable, without any substantial change in "the Word." You, however, mangled it horribly. First, I quoted from Chapter 41 (Forty-one) of Genesis, not Ch. 4:1, which is a reference to a particular line in another chapter. Second, and more egregiously, the parable involves "seven gaunt cows," not "seven gaunt sows" as you printed. Genesis was written by Jews, and you may be sure that sows were not to be found anywhere on their menus. But I forgive you (however, I'm not Jewish). Dear Mr. Buel, your cover poster is the most important act of journalism I've seen in fifty years of reading — and yes, I remember Watergate and Ellsberg. When we have a president who refuses to fully deploy our Coast Guard and who rejects help from thirteen nations offering to clean our worst disaster ever, when we have a "Justice" Department that chooses not to prosecute New Black Panther Party Members for racial intimidation of would-be-voters, when we have legislators blithely refusing to pass a budget, it's heartening to see a results-oriented person who is more concerned with proactive community than with turf, power, ideology, or greed. Bless You. THERE ARE NO "OUTSIDERS" IN THE STRUGGLE AGAINST OPPRESSION To those who talk about "inoculating" people against the so-called "violence" of the masses. Who preach against protest. 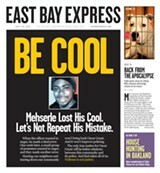 Who say "be cool." Who say they want to preserve a "peaceful and thriving Oakland" when the reality is that every day the police run rampant, brutalizing and killing our youth. Who cynically invoke the names of Malcolm X and Huey Newton in attempts to pre-emptively quell the outrage of the people. Who speak of "love" while they denigrate those who have taken a stand, calling them "outside agitators" and "extreme fringe groups" We say: WHERE IS YOUR OUTRAGE AT THE MURDER OF OSCAR GRANT? Oscar Grant, 22 years old, with his whole life ahead of him, was shot in the back at point blank range in front of his friends and hundreds of BART passengers. It was a horror. A violent, brutal, totally unjustified execution. WHERE IS YOUR OUTRAGE AT THE EPIDEMIC OF POLICE BRUTALITY? At least 100 people are killed by police each year in California. At least 1,000 people are killed by law enforcement each year across the US. Sergio Hernandez, 15, shot by border patrol while committing no crime and while on the Mexican side of the border. Aiyana Stanley Jones, only 7 years old, killed by Detroit police grenade and bullet. AND WHERE IS YOUR OUTRAGE AT THE PRE-EMPTIVE REPRESSIVE MEASURES, EDICTS, AND MILITARY EXERCISES BY THE POLICE? WHY ARE YOU SPEAKING OUT AGAINST THE PROTESTERS, INSTEAD OF STANDING WITH THEM AGAINST POLICE BRUTALITY? To those officials who sound like southern sheriffs in 1964 when they talk of "outside agitators" we say: WHAT BLACK YOUTH IN THIS COUNTRY IS "OUTSIDE" OF AND NOT SUBJECT TO DEGRADATION AND POTENTIAL DEATH SENTENCE AT THE HANDS OF THE POLICE? WHAT PERSON IN THIS COUNTRY DOES NOT HAVE THE RESPONSIBILITY TO STAND UP TO THAT OUTRAGE? This system of capitalism/imperialism is poisoning the oceans, creating dead zones; is waging unjust wars; is criminalizing immigrants; attacking women; and it enforces all of this oppression and injustice with brutality, repression, and violence. We say it is right to rebel. If the people do not resist oppression, they will be demoralized and crushed — forced to swallow their anger until they eventually turn it against each other. WHO DO YOU "LOVE"? WHERE DO YOU STAND? WHERE IS YOUR OUTRAGE AGAINST THE SYSTEM? WHAT KIND OF WORLD ARE YOU FIGHTING FOR? The system delivered its verdict, a slap on the wrist to Joannes Mehserle. It mobilized its armies of cops, its liars in the media, its networks of politicians, ministers, nonprofits, and snitches to stifle and suppress the people. We take heart that in the face of all that people took to the streets with courage and determination, and gave voice to the bitter anger of many, many more, in Oakland and beyond. There are no outsiders in the struggle against oppression. The whole damn system IS guilty. We are stepping up the battle for justice for Oscar, the battle against the whole damn system, and we are building a movement for revolution. Fight the Power, and transform the people, for revolution! Good review. Helpful clarification: You list the hours as 7-3 p.m. and started by describing the popular lemon-ricotta pancakes. We went there today; however, the pancakes are only served on weekend brunch and the restaurant has defined hours for breakfast and lunch i.e. breakfast weekdays 7:30-10:30 and lunch weekdays 11:30-2:30 with brunch 9-2 week-end. We arrived at 11:00 unfortunately. We looked in window and walked by. The owner, Patrick, came out. He asked if we were in search of the pancakes. He was most cordial and spent awhile talking with us. He gave us copies of their 3 menus (their web site is being revised) and two of their pastries (delicious). Another couple arrived and seemed to have info re hours that was not fully accurate.